The Micronair Spray Pod System enables a suitable aircraft to be converted to a spraying role within hours. 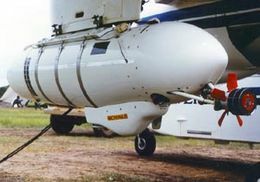 Two completely self-contained spray pods are mounted on standard underwing pylons, thus eliminating any need for structural modification of the aircraft. As the entire spray system is external to the fuselage there is no risk of chemical contamination of the cabin. The versatile pod system has many applications, ranging from agricultural, locust and mosquito spraying to pollution control. Micronair can provide a detailed proposal and installation kit for any other suitable type. 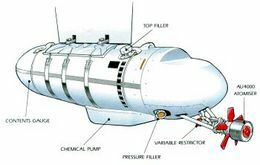 The body of the pod forms the chemical tank. This is manufactured from glass reinforced plastic (GRP) composite material for light weight, durability and chemical resistance. The aerodynamic profile ensures minimum drag. Pods are provided with internal baffles and a cross-over vent to ensure stability and freedom from spillage at all flight attitudes. Each pod is fitted with a Micronair AU4000 atomiser. This uses a rotating wire gauze cage to break the chemical into evenly sized spray droplets. This unique approach ensures that all the spray volume is concentrated into a narrow range of droplet sizes. The size of the spray droplets can be adjusted by varying the rotational speed of the atomiser, thus producing the optimum size droplet for the chemical and application technique being used. 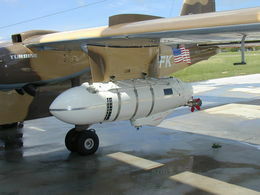 The Pod Spray System is controlled and monitored from a panel which is installed in the cockpit of the aircraft. The control panel is connected to the pods by a wiring loom. The loom and its connectors are permanently installed in the aircraft. There are no mechanical or fluid connections between the pods and the fuselage. Application Rate: The number of litres or gallons being applied on each hectare or acre. Flow Rate: Chemical flow rate from each pod in litres or gallons per minute. Total Volume A: The total number of litres or gallons of chemical sprayed from each pod. The total can be re-set at any time. Total Volume B: The total volume sprayed from each pod. This cannot be re-set whilst spraying and can be used to check job totals. Area in Hectares or Acres: This is the total area covered whilst spraying. Work Rate: The coverage of the aircraft in hectares or acres per minute. Spray Time: The total time for which the pods have been spraying during a job. Atomiser RPM: The rotational speed of the atomiser on each pod. Micronair has the experience and facilities to design, manufacture and assist with the airworthiness certification of a wide range of specialised spray systems. These systems range from simple atomiser installations to complete spray systems comprising chemical tanks, spray booms, structural modification and instrumentation. Piper PA25 Aztec – Public Health and pollution control spraying. Beech Baron C55 – Tsetse fly control. CASA 212 – pollution control. 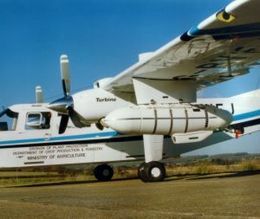 BN-2 Series Islander – several variants for locust control, public health and agricultural spraying. Douglas DC3 – public health and forestry spraying. De Havilland DHC – 4A Caribou – waterbomber system for forest fire control. Aerospatiale Super Puma helicopter – locust control. Aero Commander 690 – Tsetse fly control. Micronair’s wide experience in the design and development of these systems enables the Company to offer a practical and cost effective solution to almost any specialised spraying requirement, whether it is an adaption of an existing system or a new project to meet an exacting specification. Micronair stainless flowmeter turbine with tungsten carbide bearings. Note: This specification is provided for reference purposes only. 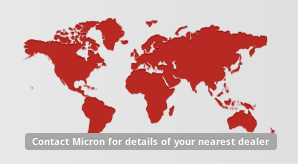 Micronair Limited reserve the right to alter the specification without prior notice.